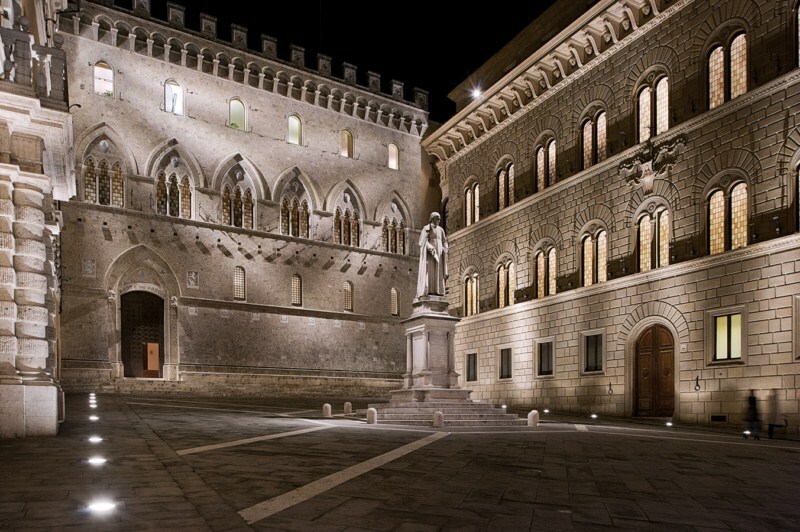 Our route starts from Piazza Salimbeni, historical venue of Siena, where is based Monte dei Paschi di Siena bank. From Piazza Salimbeni we reach Piazza Tolomei. 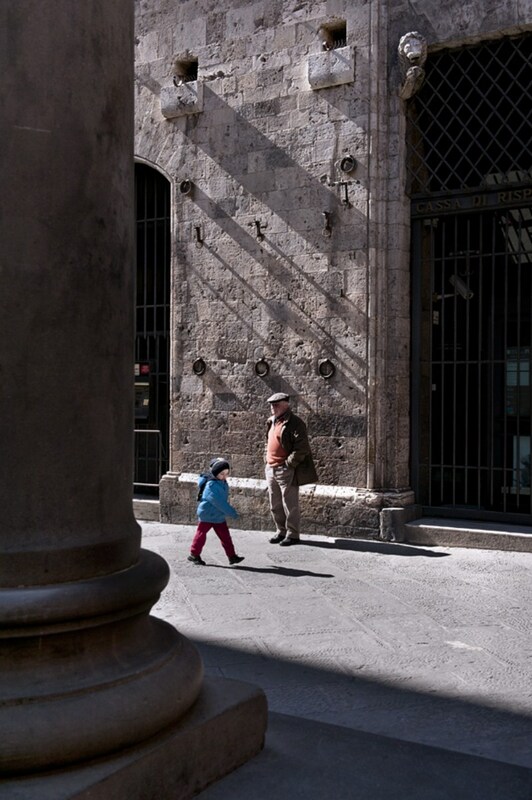 Staying under the column with the she-wolf that reminds to the Roman origins of Siena, we watch Palazzo Tolomei. The building is a reconstruction that dates back to 1270. 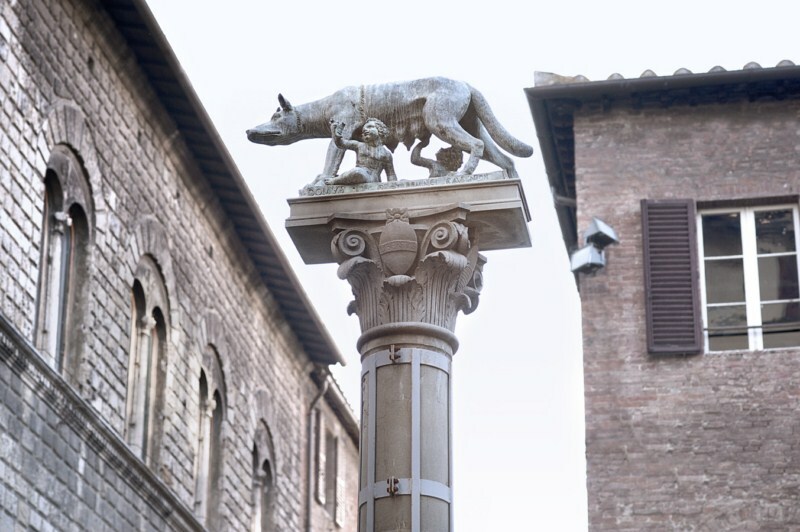 The palace rises on the main street of Siena and the elegant biforas that enchanted John Ruskin in the XIX century, sing to the people a message of richness and power, just like the lions that hold the globes, under the noble coat of arms of the family. 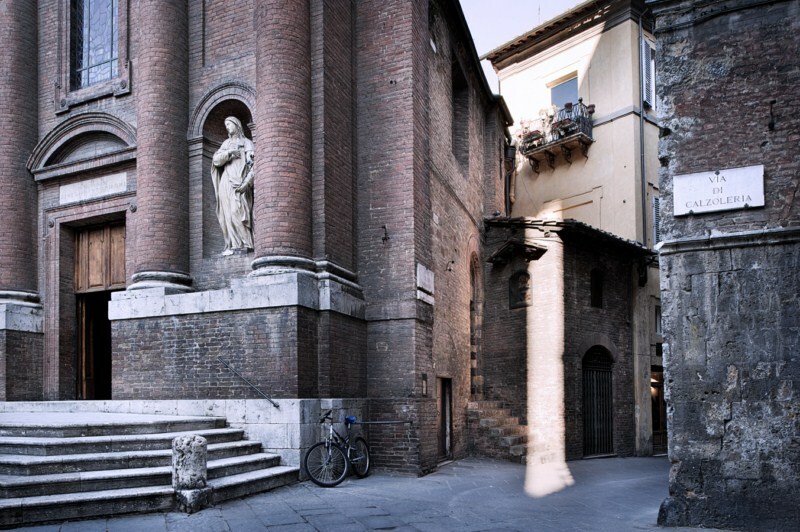 André Pératè, in 1918, consider this as a witness of the golden age of Senese history: “The Tolomei square, always lively end noisy, was, before the construction of Public Palace – we know it thank to the novel by Montaperti – the center of political life of Siena. 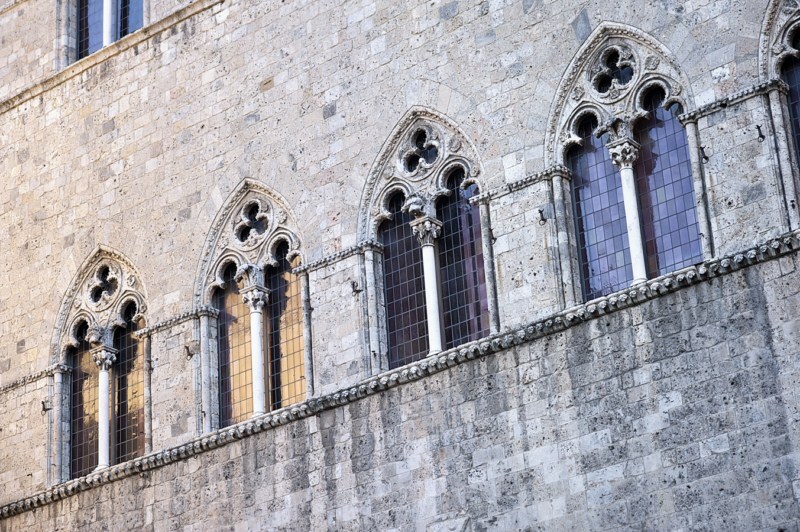 The ancient palace that has the gothic windows displayed in a facade of grey rough stone, tell us like a faithful witness about the moody days of anguish and thrill, when the power of Siena, during the Government of Ventiquattro, reached the top of glory. “Tolomei Palace is unique. Nothing is beauty as its elegant allure and its savage leap. The distance and solitude fill its lungs, more than pride… It has one floor, between a great base and a ledge. 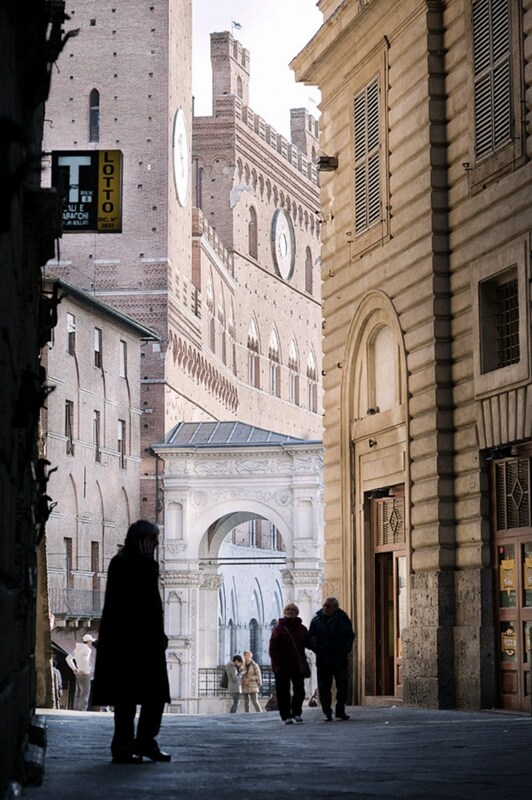 It’s unique in Siena and Italy… And all the rest, until the jutting edge of the floor, is a bare wall, that conveys a great void and a sublime solitude”. These are the aesthetic impressions of the French writer André Suarès in 1929 about the elegant house of Tolomei, Medieval bankers of Siena, that they commission at the beginning of XIII century. 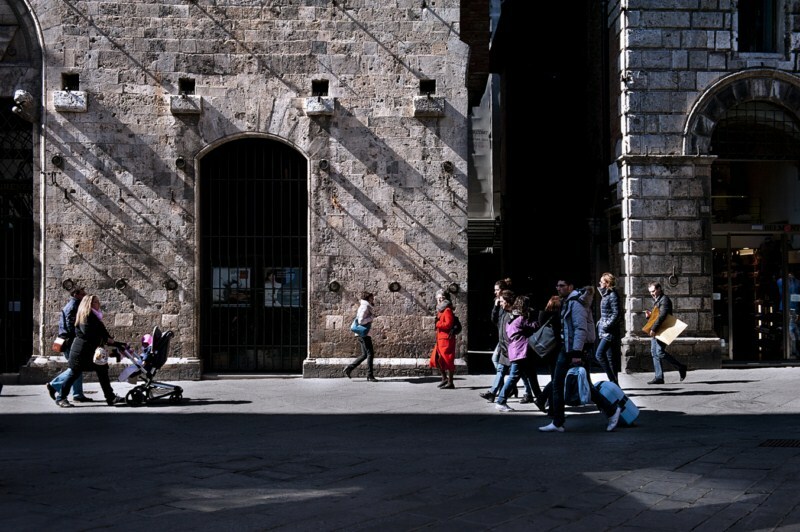 Leaving the square, through via di Calzoleria, we arrive at via Banchi di Sotto, then, on the left, we enter in the district of another rich and powerful ancient Senese family, the Piccolomini. 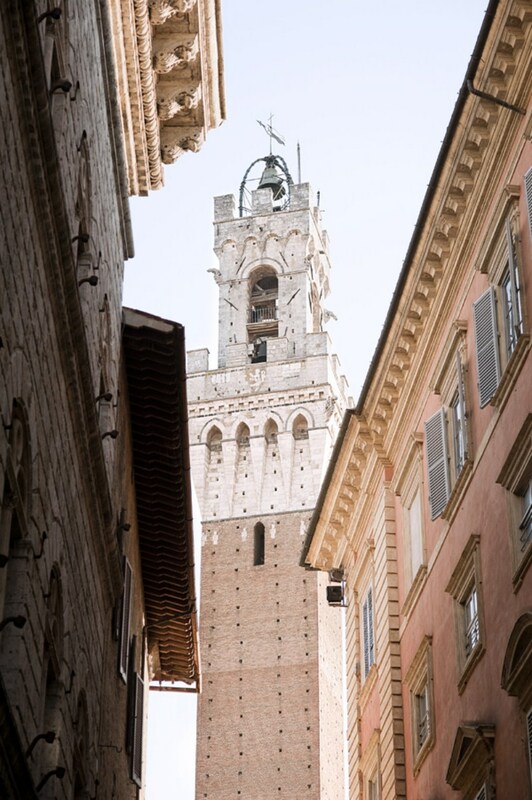 The most imposing palace is the Piccolomini Todeschini, in white travertine, now base of the Archive of State. 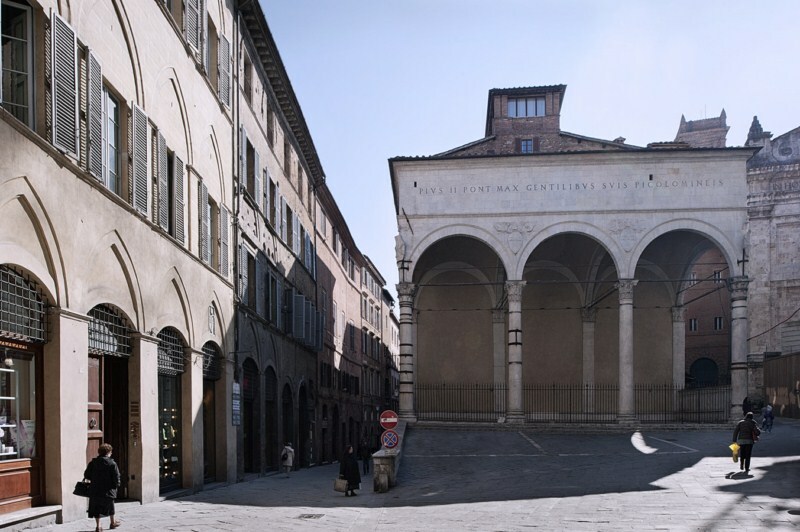 Built in 1469 by the follower of Leon Battista Alberti, Bernardo Rossellino, on commission by the nephews of Pope Pius II Piccolomini, is the only example of Renaissance architecture style in Siena. 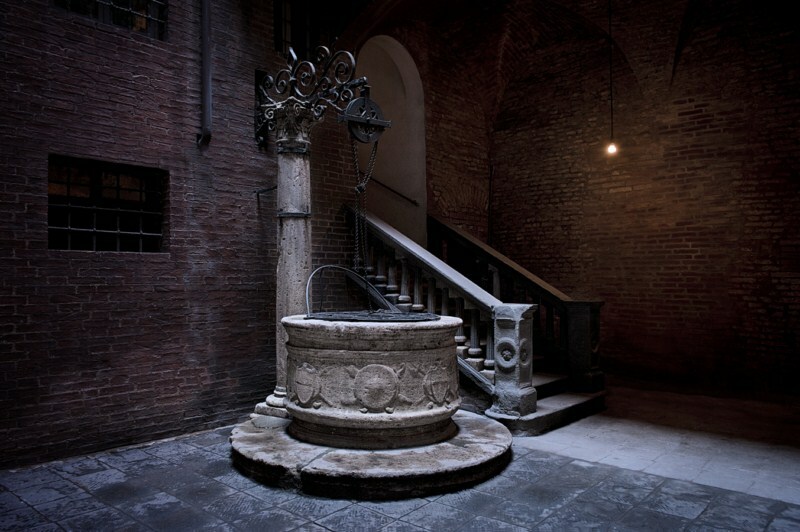 The Archive of State in Siena is one of the biggest in the world, that keeps documents from 736, among which the testament of Giovanni Boccaccio, author of Decameron. 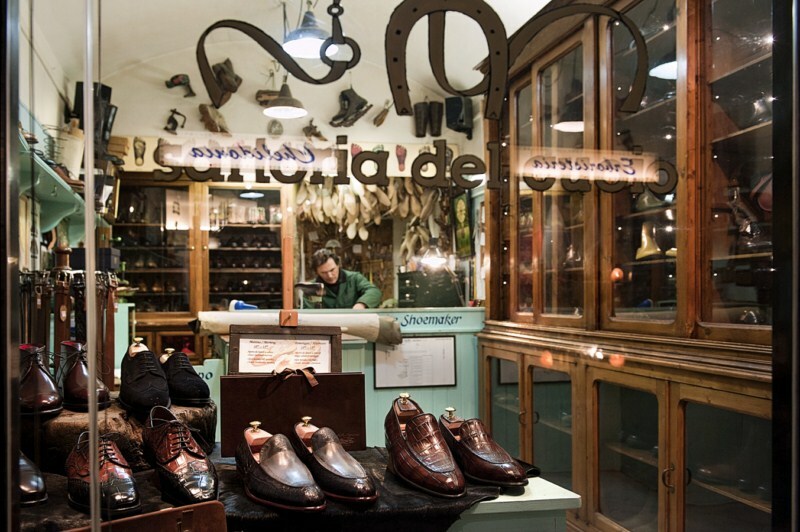 There is also the museum of Biccherne, that is one of its kind. 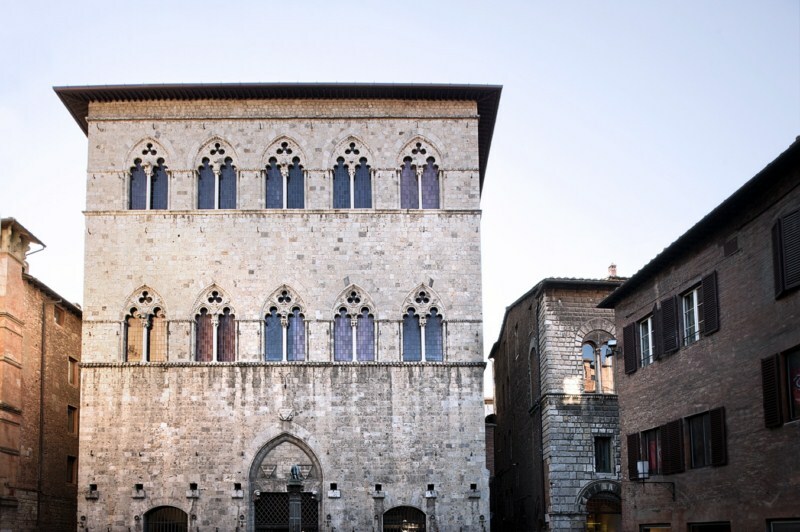 The Biccherna was the tax office of Siena Municipality, that every year asked to the best Senese artist to decorate the covers of account books; this tradition lasted from XIII to XVII century. 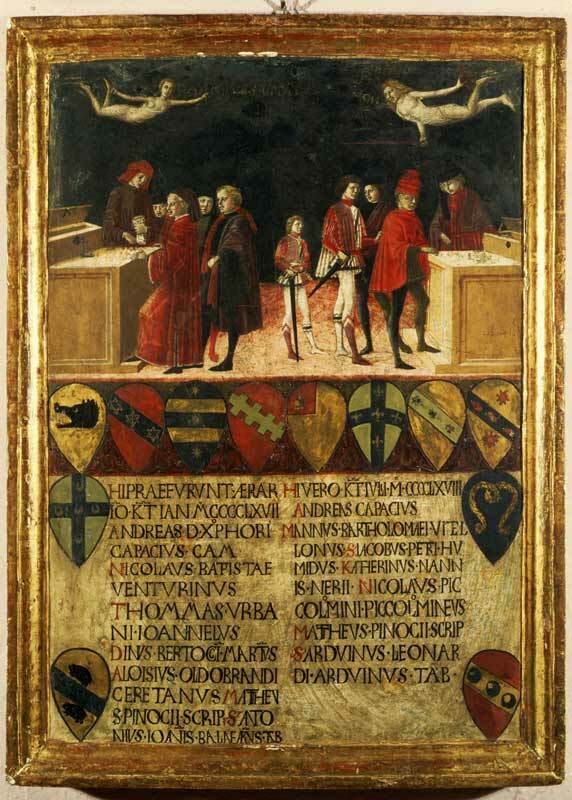 Among the various artworks, the most interesting are those that depict the everyday life in Siena during the Middle Age and Renaissance. Came out from the palace, on the right, there is the Loggia del Papa; elegant Renaissance building designed by the Senese sculptor Antonio Federighi in 1462 on request by Pope Pius II, that wanted to place it his emblem and the words PIUS II PONT MAX GENTILIBUS SUIS PICCOLOMINEIS, that is Pius II ordered to built this Loggia only for his relatives Piccolomini, not for all the Senese people; they could only enjoy the privilege to see the members of Piccolomini family gathered during banquets. Proceeding through via Pantaneto we enter the Contrada of Unicorn. 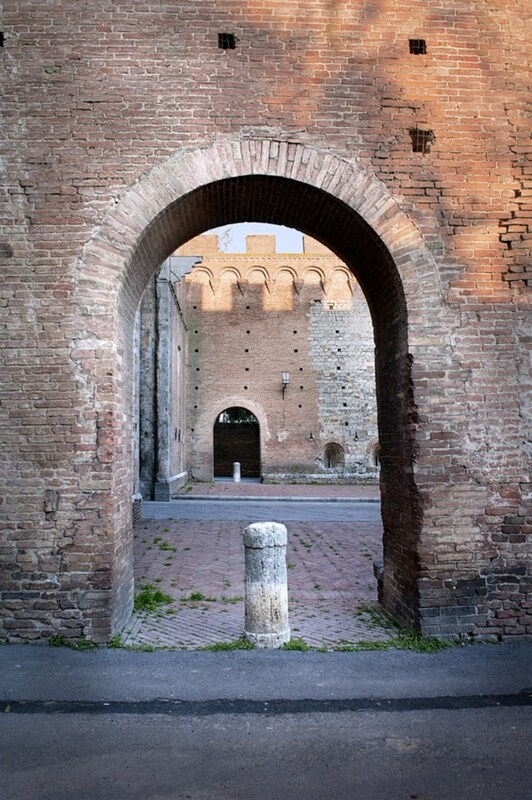 This walk can ends where the Francigena road starts its route for Rome, at Porta Romana. On the arch of this elegant entrance we can admire the last masterpiece by Sassetta, refined artist of the Senese Renaissance, among the most liked by the American collector and historian Bernard Berenson. The last artwork is a fresco that depicts the Coronation of the Virgin, finished by the Sano di Pietro painter, because Sassetta became sick during the painting of the arch, then he died because of a pneumonia. 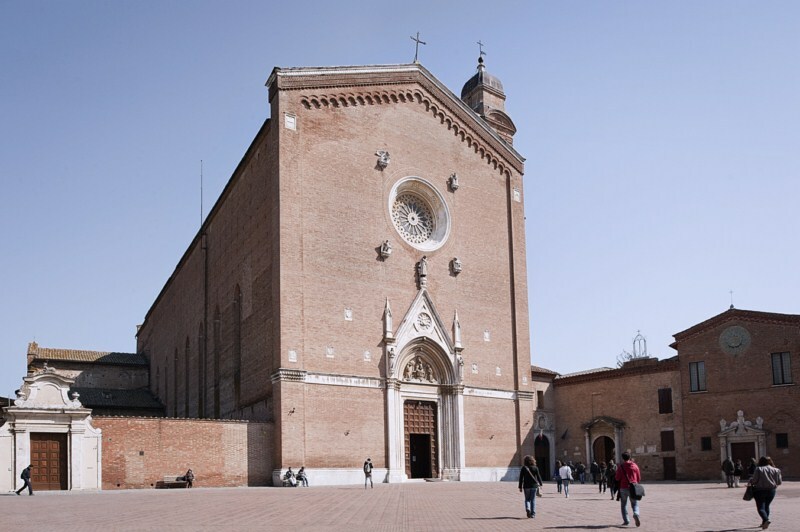 Today the fresco is held in the church of San Francesco. 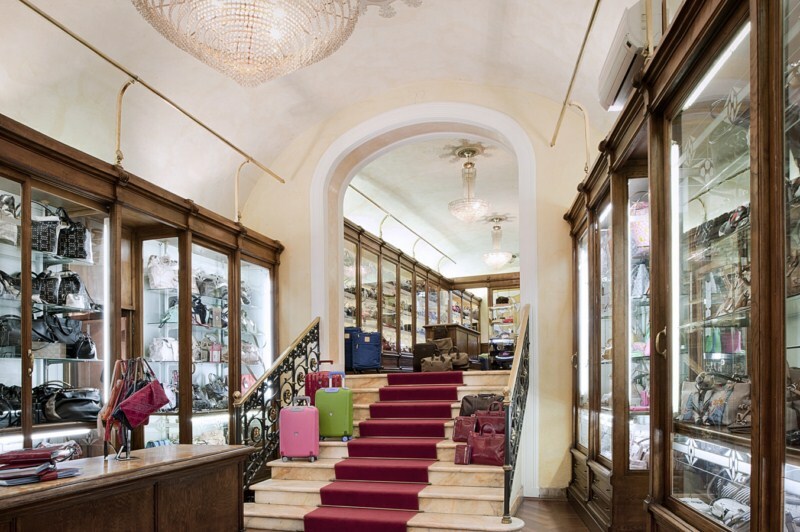 Walking this itinerary, Palazzo Ravizza suggest you to visit the ancient Pelletteria Falchini and the workshop of a leather craftsman that do a series of unique and original products.